Two years ago I bought a book called Authority by Nathan Barry. The basic premise of the book is to teach on a subject, and become perceived as an authority on that subject. After you become in authority, you can begin selling products at a higher value, grow your business and audience. This approach came across as too simple for me. Teaching could not be the key to finally growing my business to where I wanted it to be. I put together a quick PDF guide and began creating videos teaching on business. When I uploaded these videos online, people began to follow me on social media and ask questions. The test revealed teaching could be an effective content marketing strategy. That’s the reason why for the last year I have committed to teaching on my podcast as well as making videos every week. I’m teaching everything that I know about freelancing and business. My challenge to you is that you will also begin to implement teaching in your own business so that you can start to grow your audience in flex your muscles around what it is that you do know. The more experience you have, the more you tend to forget what it was like when you first started. This is an advantage. You don’t have to know everything before you start teaching. You only need to know more than the audience who is listening to you. If you’re willing to share as you learn and what you discover, you’ll appeal to a beginner. There will always be new things to teach about. I remember when Snapchat first came out, it was a new social media platform and the early adopters of Snapchat began releasing guides, blog posts, videos, and other learning tools to teach others how to use Snapchat. There is no way anyone was an expert at Snapchat because it was brand-new. However, those who learned the platform and shared what they learned were perceived as a Snapchat expert. Don’t wait to be perceived as an expert before you teach, you are perceived as an expert because you teach. If I was to ask you to name a top chefs in America more than likely, you’re going to name someone who has been on the Food Network. The only reason you know who they are is because they have a cooking show in which teaching is involved. This is no different from what happens with professors at a university. If I was to interview and a professor from a university interview on the same topic, you tend to favor the professor’s opinion even though I may have said the same thing because they teach people. A fear people have “if I put myself out there and begin teaching someone may see me make a mistake or teach something wrong and I’ll look stupid.” If you happen to be make a mistake, apologize and create more content about why you were wrong and what the correct information is. This shows that you’re humble enough to admit when you’re wrong and also you’re willing to correct any wrong information out there. Think about waking up in the morning and watching the morning news. There’s always a weather segment where a meteorologist gives the forecast for the day. There are many tools which can predict different weather patterns but often times the weather man is wrong. He says it’s going to rain and he doesn’t. He says it to be a light shower and it rains for three days. Yet people still tune in and listen to the weather segment because most of the time they are right. The weatherman wrongly stating the weather doesn’t make him any less credible. People return to his advice because he’s teaching on what the weather will be. As you start teaching on topics and continue to put content out there, people raise their hand if they have questions or corrections or differing perspectives and you can use that information to begin to tweak your content in teaching style to cater to those people. What should I teach on? Make sure the topics you are covering relate to the industry you would like to serve. An excellent example of this is Femke (designer) and Owen (developer) of The Apartment. One of the main articles they promote is an article called Why you need a professional website? If someone reads this article, they are teaching the reader the necessity of a website and the service they provide is the answer to what they are teaching. Don’t be afraid to give away all of the secrets. Don’t be afraid to give away your process or reveal how you do things. Most people believe that if they give away the “behind the scenes” or the secret sauce that someone may take that information and not use their service. This works the opposite way. When someone observes all the steps in the process, there is a newfound appreciation for what it is you. All of those steps would be time-consuming, and they would rather pay someone who is efficient at it, rather than waste days trying to figure it out. Even if someone uses what you teach and applies it your building trust with them because you gave them advice and your advice worked. That’s where the law of reciprocity kicks in. You continually giveaway value and they’ll feel the need to give you something in return. If you’ve received any value from the information I’ve been teaching in this past year, consider signing up to get on the wailist for the Freelance Jumpstart Course. 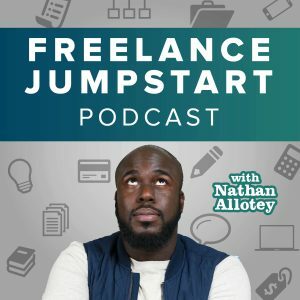 I’m going to bundling everything I learned about freelancing, clients and business into one affordable package.